Dimension: 11.5" x 9.5" x 4"
We are the leading supplier of leather satchel bag. We offer a wide range of Writers Satchel Bags which can be used for official purposes, meetings and conferences. These are incorporated with strong and long straps and can be slung across the chest. Further, different pockets are attached for storing items. We “Arham Exports are a renowned manufacturer of a qualitative assortment of Laptop Briefcase Satchel Brown Bag. Description: This Leather Satchel is having one mobile pocket, one slip in pocket, a zip pocket inside and a zip pocket at the back. Color Available: Light Green, Cream, Grey, Beige, Brown etc. Being a leading enterprise of this industry, we are offering a huge range of Canvas Satchel Bag. Made of Full grain genuine Goat Leather tanned using natural ingredients. 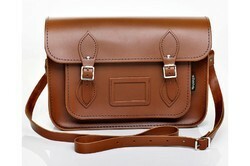 Ladies Satchel Bags specially designed for women. The top can be fully open by releasing the dog hook. Loop closure with turn ring lock. Gusseted flap covered front pocket with magnetic closure. Back side open pocket. Inside zipper pocket and 2 open pockets. Drop length 11 inch. All rich quality metal fittings and YKK zipper. Secure, protected, front zipper compartment has accessory pockets for portable mouse, phone, iPod and pens. 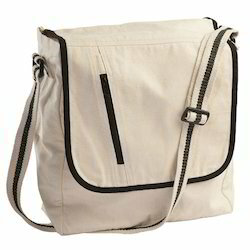 Removable shoulder strap with swivel hardware and padded handle. Top-load access for laptops up to 17.3 inches. Handle with structural stability. Features a secure, protected accessory organization and roomy bulk storage.